After Cartagena, we arrived in another tropical beach town: Santa Marta. Though normally just used as a jumping-off point for Tayrona National Park (it’s a short 2-hour collective ride to the main entrance), we adored this town for its comfortable accommodations and amazing local food. We heard mixed things about Santa Marta from the internet before arriving, so to confirm a few things: yes, the city is not the cleanest – there’s tons of dust in the streets. Yes, the traffic can be insane – we learned to walk in the traffic jams. And yes, this beach party town can get sleeplessly loud at night – we brought earplugs. But between living off of fresh-squeezed juice of every kind of tropical fruit imaginable to walking the beach at sunset (still lovely in the rainy season, by the way), I don’t think we can complain. We started our Santa Marta trip by checking into the dorms at La Villiana Hostel. Since the hostel also doubles as a bar, bring earplugs to ensure a good night’s sleep. Also bring your swimsuit because the hostel has a small pool for a midday dip on hot days. Sweet, cool relief: La Villiana’s pool offers a break from the midday heat. 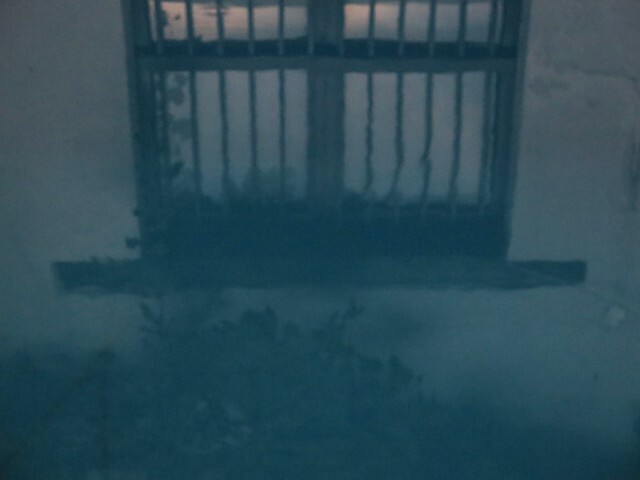 Here’s a window of the hostel reflected in the water. They also had lockers available and drawers underneath the bunks for your bags, which does away with tripping over everyone’s stuff when I have to use the restroom at night. The only downside I found to the rooms is that they can get insanely cold at night because they turn on air conditioning and fans. It may help some people sleep, but because they only handed out sheets I was frigid the first night. I slept in a sleeping bag the rest of the nights because attempts to ask them about additional layers ended in failure (although they have a sign saying they have them). So think of this hostel as a BYO blanket kind of place. We went over to Tayrona National Park after a couple of days here, and the hostel was happy to store the extra stuff we didn’t want to lug in with us. Whether or not this storage service cost money weirdly depended on which front desk staff you asked, so we asked a couple of people until one person pointed us to the storage location and we dropped a reusable grocery bag there, tied shut – I’m not sharing that one to keep everyone else’s stuff safe. When we came back our stuff was still there and untouched, although buried by other people’s bags, so we can happily say that your stuff is safe here as long a no one sees something tempting. Don’t store anything that might be sensitive to having 15 heaping travel packs piled on it, though. 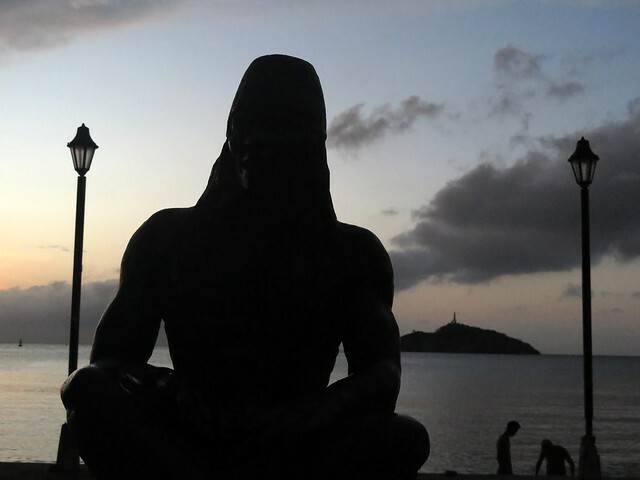 Ahhh, this is where Santa Marta really shined. 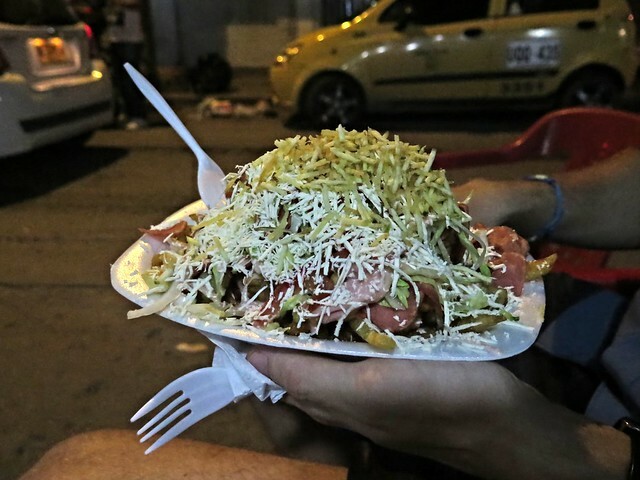 There were two spend categories of food: street cheap and restaurant expensive. Being us, we stuck mostly with the street cheap and enjoyed eating at the amazing street markets. 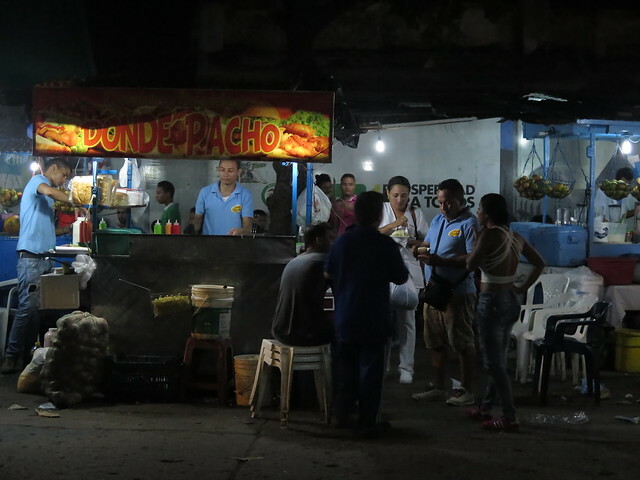 Our local haunt was the street market that takes over Calle 16 between Carrera 5 and Carrera 6, just east of Catedral de Santa Marta. 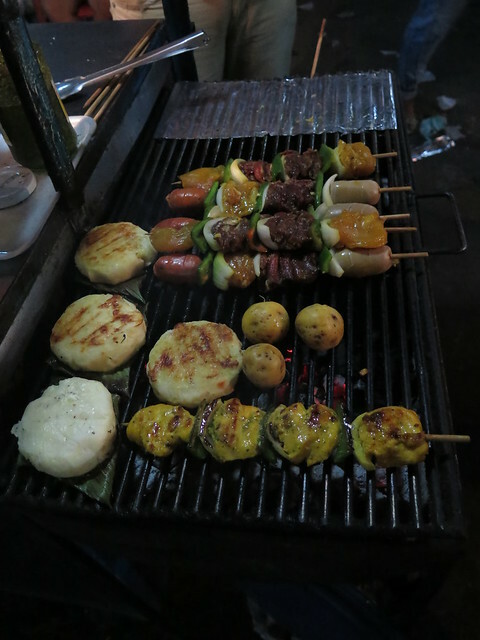 Grillfest: get kebabs, potatoes, and arepas all grilled to perfection at the street market. Abandon hope, all ye who enter here: beneath this pile of fried potato skins, cheese, sausage slices, bacon, lettuce, tomatoes, and onions lies half a pound of french fries. 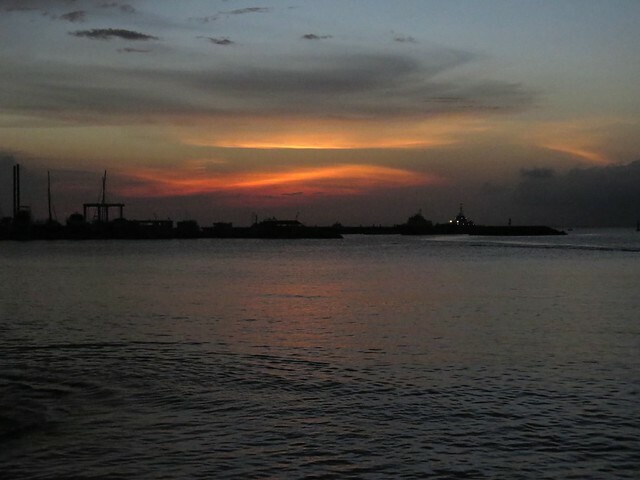 Sunset over the beach in Parque Camellon, Santa Marta. 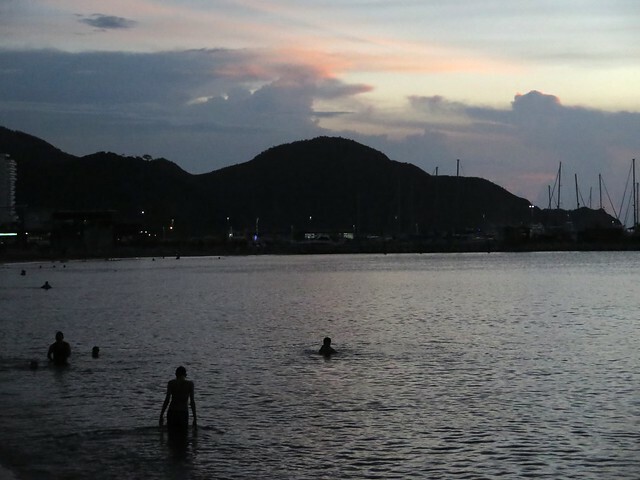 People swim at sunset in Parque Camellon, Santa Marta. Apart from that, we spent our time here relaxing and planning our trip to Tayrona National Park. 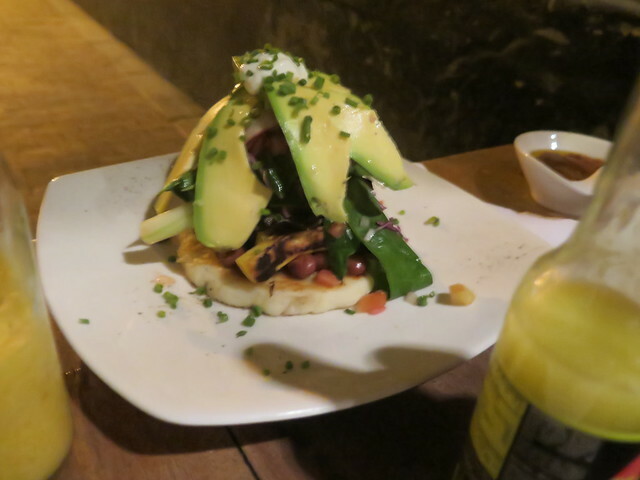 *My reference here is Rubamba, our beloved arepa place back in New Haven, CT. 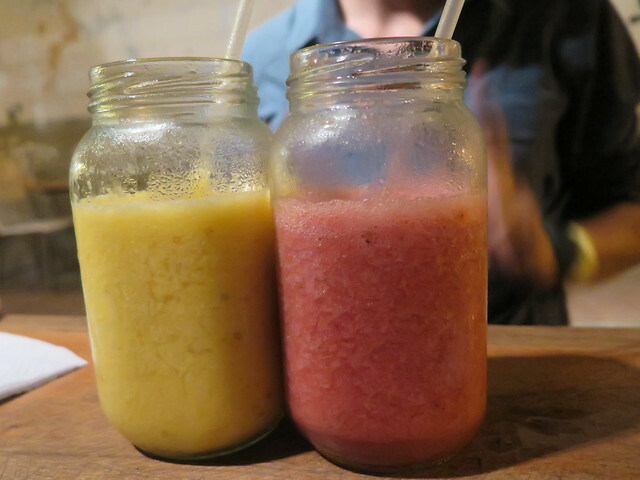 There two arepas and drinks would run you about USD $25 before tip, so a total of roughly $30 for a night out there. Of course this price for a nice night out might be comparable to some other U.S. restaurants, but overall it still runs cheaper. Lulo! It was one of the few restaurants open (thankfully) when we returned to SM on a Sunday, from Tayrona. The food was delicious. Yesss! It’s even open super late (maybe 10 pm?) and then open again for breakfast the next day.